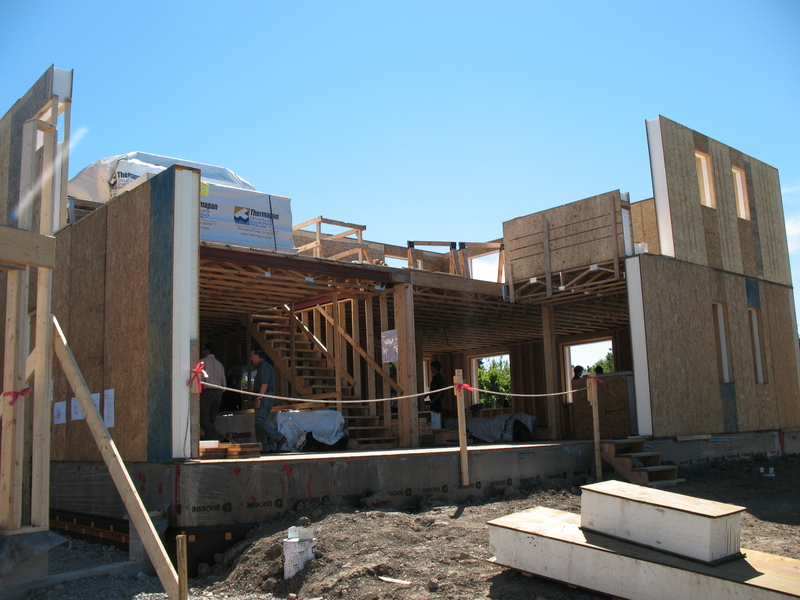 KingstonPassiveHouse | Thoughts, Design and Construction of Kingstons' first "Passive House"
The house is not yet complete, but with the colder-than-average winter we’ve been having, I’m sure many of you are curious to know how Kingston Passive House is performing. The building envelope is mostly complete; the only items missing are the 3 exterior doors. Even with 2 of those doors being nothing more than 2 sheets of 0.5-inch plywood (The third is a temporary steel door) we have been very impressed with the performance thus far. Our active heat source is a standard 4800W construction heater. In terms of passive sources, we have a pair of dehumidifiers running and of course a few CFL bulbs during the day (basement). We keep the house at 14 degrees; certainly not warm, but a good temperature for working. Even on the cold days (below -20 Celsius) The construction heater only runs about a quarter of the time to maintain temperature. When the sun is shining, the temperature rises in the house – sometimes by as much as 3 degrees! We have to be realistic here; it will take more energy to maintain 20 degrees, and we’re also not running the HRV yet. Even when we consider the less-than-adequate doors and absence of inhabitants and other passive heat sources, the consumption will most likely go up a bit. These early indicators do give us comfort that we’ve done things right; they’re a glimpse into the future, a taste of what’s to come in a super-insulated, air-tight home and it’s really quite exciting. Using an IR thermometer, we have also measured internal glass temperatures of the tri-pane windows. With the sun shining, we get readings of 21 – 23 degrees on windows with a hard low-E coating (better solar heat-gain coefficient) and glass temperatures on the shaded side of the house (soft low-E coatings) were about 1.5 degrees cooler than the ambient air temperature. Putting the raised-heel to use… Cellulose blown in at 36″ deep = R-105! 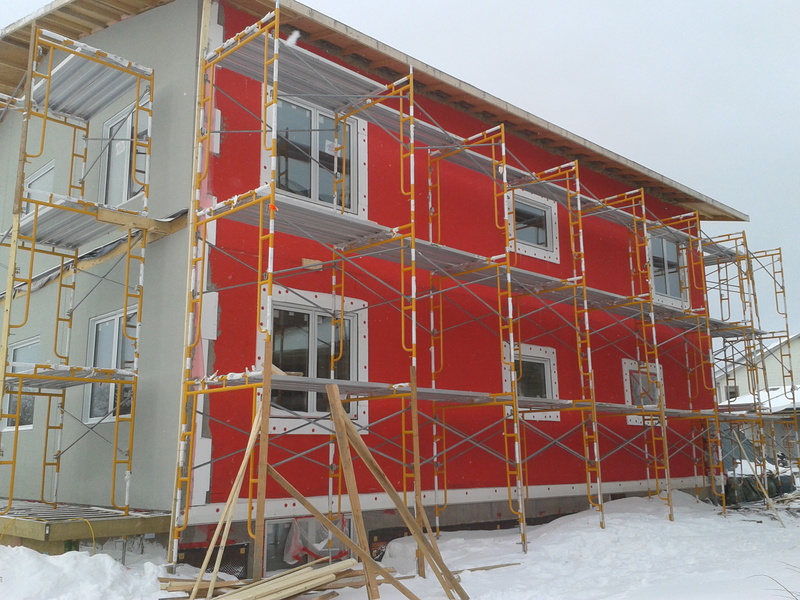 The water-proof layer under the EIFS was a festive RED… Sure got the neighbors talking! Once the EIFS was complete, the porch roof could be built. 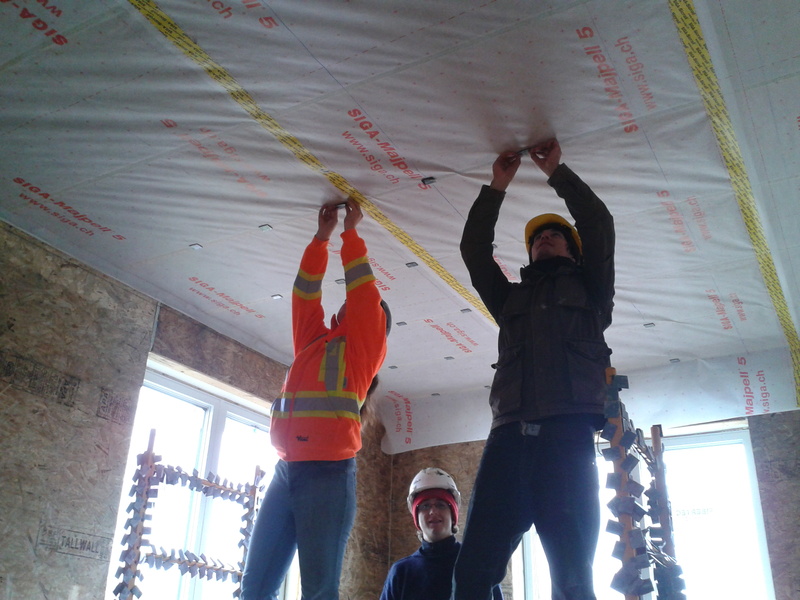 While installing a vapour barrier is smart, it’s also a requirement of the building code – and for good reason! Without air-tightness, all that insulation is for nothing, at least in terms of energy conservation. A drafty wall assembly is also an invitation for moisture buildup from condensation, which leads to a drastically reduced efficacy of insulation, mold growth and rot. 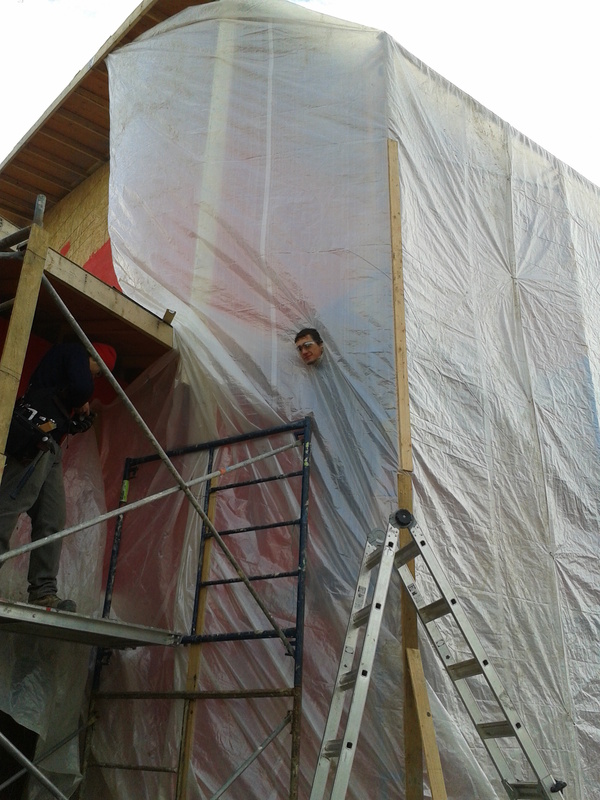 In a Passive House, the vapour barrier has the same job, and is installed in the same place (on the warm side of the wall assembly), but with three subtle, yet important differences. The first is detail; we’re going for a very tight building envelope, and achieving 0.6 ACH @50 Pa (or better!) requires a very high level of detail in terms of planning and installation. The second and third are permeability and strength, hence the title of this post, but with a slight change in punctuation: “A vapour barrier that’s smart“. As the picture shows, we have specified an engineered truss design with a rather substantial 32″ raised heel at the wall. 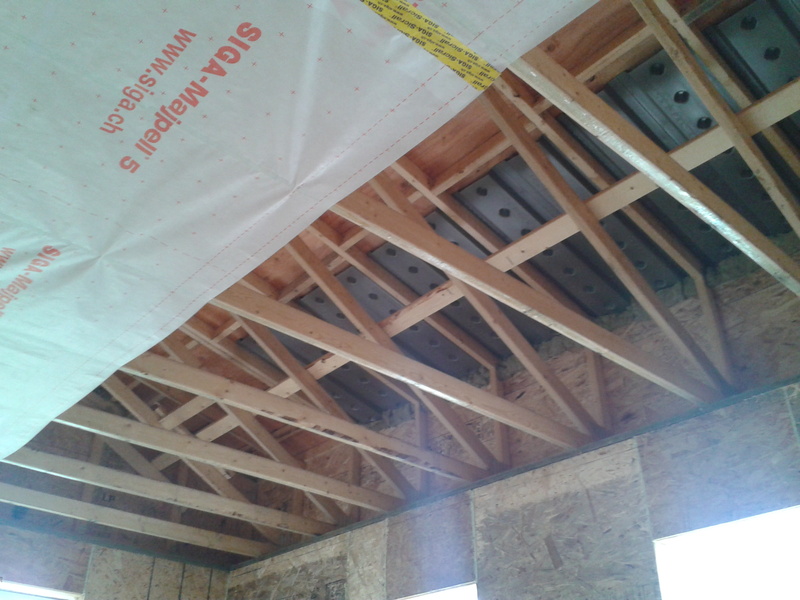 A “regular” truss would allow for about 6-8 inches of insulation at this location. We’re looking for full-depth insulation everywhere. That amount of insulation (we’re blowing in cellulose) introduces a couple challenges, namely mass and reduced airflow. This is where smart vapour barriers outperform the standard 6-mil poly. We’re using a product which has 2 layers; the first is a fabric which greatly improves its strength, and the second is a membrane. Limiting airflow through insulation is what makes it effective. 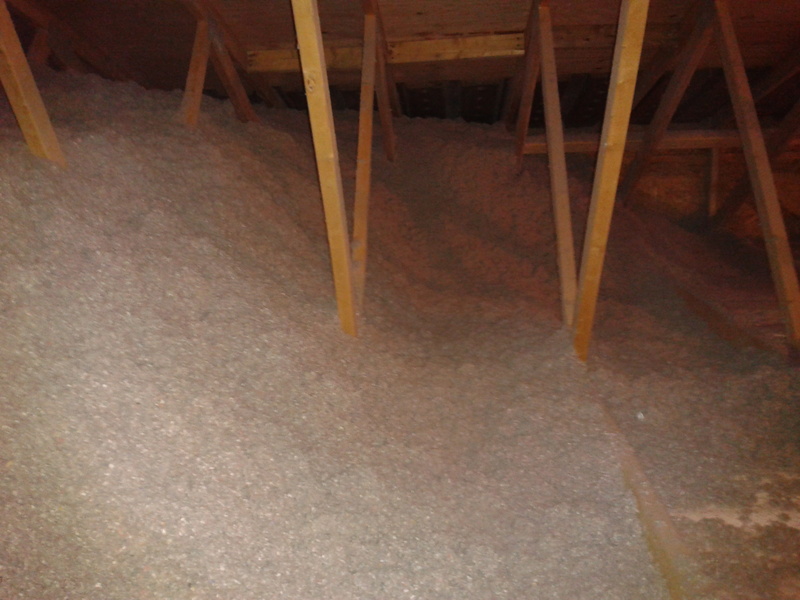 With this much insulation, it also means a reduced ability to dry out, should moisture be present. It’s not that we’re planning for a leaky roof – moisture will always be a factor; take a look in your attic after a snow-storm with winds. Vents will allow snow into the attic and when it melts, evaporation is how it dries. With 32″ of insulation there’s very little airflow, so we’re relying on a smart membrane to assist. What makes the membrane smart, is its ability to become vapour-open in the presence of moisture. The fabric layer is required to resist stretching under the weight of all that insulation. We were also concerned about the possibility of staples being ripped out over time, creating holes in the vapour barrier. To that end, we decided to use a super-sticky reinforced double-sided tape in place of staples. Should the weight of the insulation force the tape to let go, we won’t have to worry about a thousand holes in the membrane. At this point, we’d normally install metal resilient-channel to the underside of the trusses. This gives us something to attach drywall to at 16″ O.C. (trusses are typically 24″ O.C.) and helps protect the drywall joints from truss-lift in the dry season. We chose to do things a little differently; in place of resilient-channel, we installed 2×3 on its edge. This is much stronger (better support for the vapour barrier and insulation) and provides a 2.5″ deep service cavity for all the electrical work. Our electricians did not poke a single hole in the vapour barrier. The plumber is another story, but that’s not his fault; in Ontario we’re not allowed to use air-admittance-valves (aka “cheater-vents”) in new construction. We went a little O.C.D. 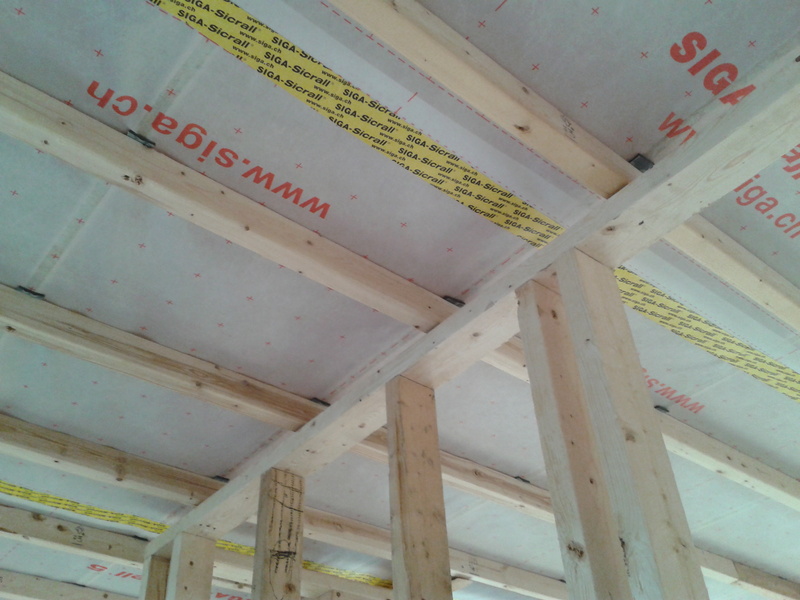 on the 2×3… to ensure the long screws didn’t result in leakage through the vapour barrier, we chalked lines and placed foam gasket tape at all intersections of the 2×3 and trusses. The scaffold took on a new “look” with all those gaskets stuck to it. With one person pushing the scaffold and two people placing, it was done in no time. Installing the 2×3 also went well with teams of two. We chose to pre-drill the 2×3 so the wood screws had more truss to bite into, drawing the 2×3 in and compressing the gaskets – no leakage there! We were also careful to eliminate leakage potential around the perimeter. 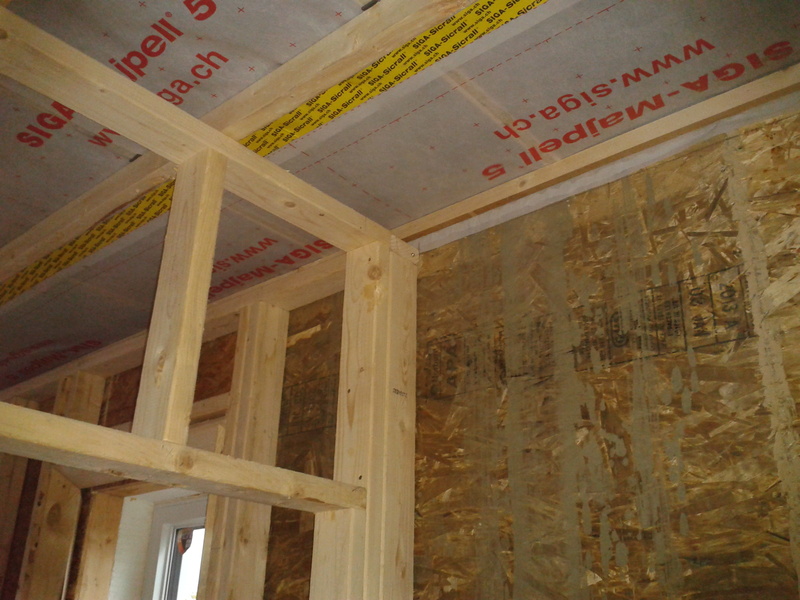 This being a SIP house, the inside OSB sheathing is our vapour barrier for outside walls. Where the walls and ceiling V-B meet we applied a generous bead of polyurethane caulk and then nailed strapping to the wall (through the calking bead) to support the weight of insulation. This method is strong and air-tight, but means we’ll have to be careful when screwing drywall to the 2×3… keeping screws to a minimum where the ceiling meets internal walls. 18 inches should do the trick – allowing the ceiling to flex a bit at those points. Curved walls? A Passive House deserves architectural details too! After a few hiccups with our supplier, we finally have all the windows installed. It’s amazing how much of a difference that makes to the environment inside the house. I love fresh air, but when it’s blowing the plan-set all over the living room, there can be too much of a good thing. The installation process went well. Removing an operator here and there helped lighten the load a bit; tri-pane windows are noticeably more heavy than their double-pane counterparts. Installation started out the same as any other house… a level, some cedar shims, fasteners and special low-expansion foam (which remains flexible – this is important!). The first photo shows an installed window in the SIP wall assembly. What you can’t see (translation: what I forgot to take a picture of) is that each window opening was first detailed with a trowel-on elastomeric water-proof membrane, also called the “Weather-Resistive Barrier” or WRB. 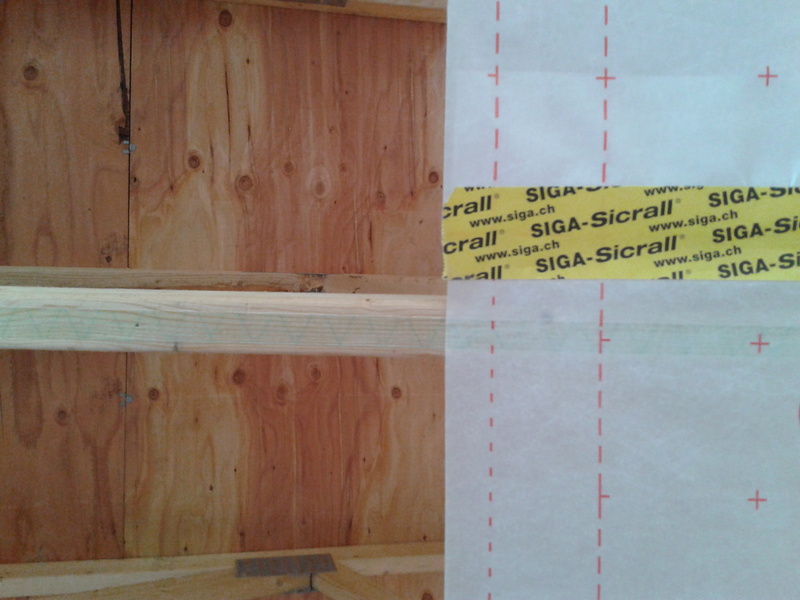 The most common WRB’s are of the “house-wrap” variety, of which Typar and Tyvek are the most popular. The main detriment to wrapping a WRB around a window/door opening is that it makes it difficult to air-seal on both sides of the membrane. With a trowel-on membrane, it is sealed to the substrate (frame opening) when applied and the window is subsequently sealed to it; far less opportunity for air leakage. The other detail missing is the outermost 2×4 window buck hiding just behind the inside edge of the window frame. 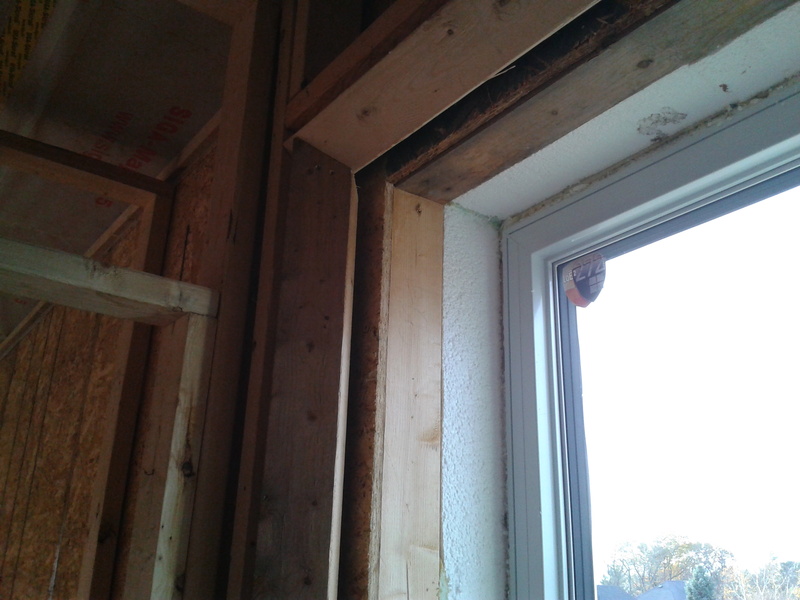 Though not significant, that 2×4 does represent a thermal bridge in the window installation so we chose to isolate it by wrapping the interior of each window opening with polyiso insulation. 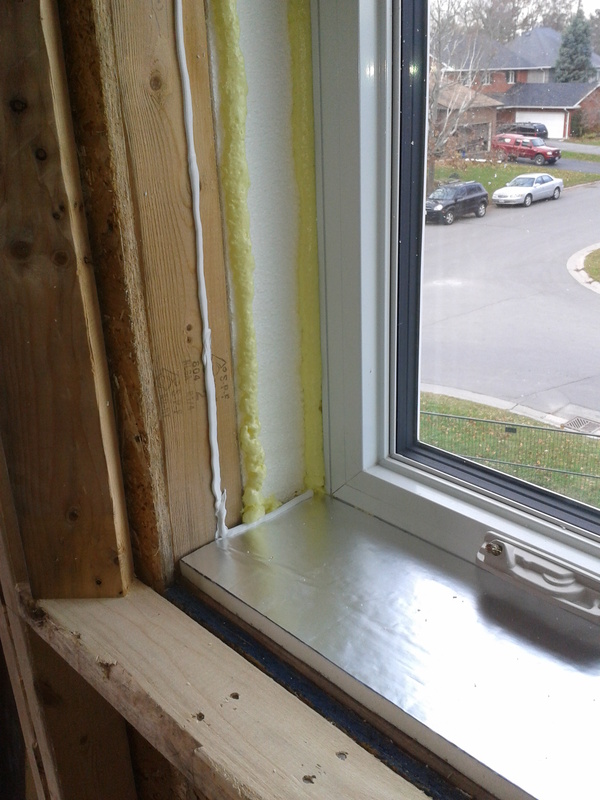 Two beads of spray-foam and a bead of calking ensure it also becomes part of the vapour-barrier continuation. 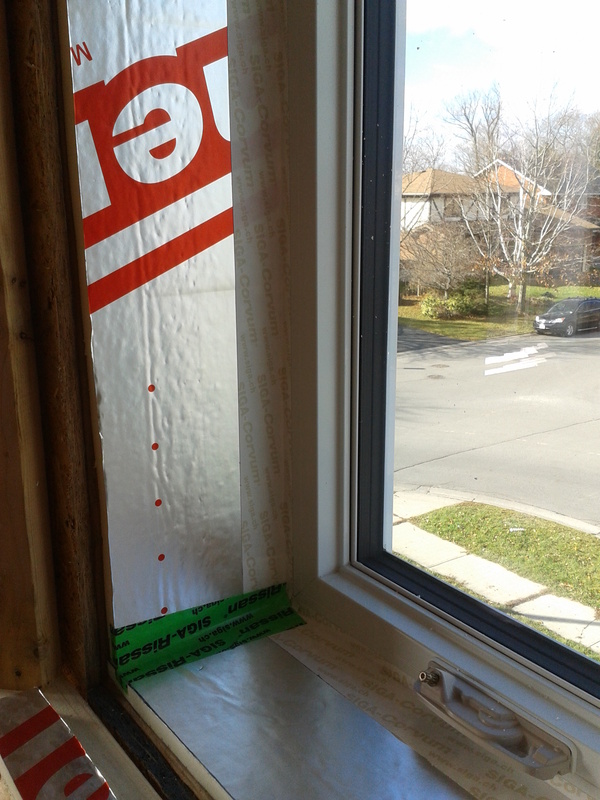 Finally, an application of air-sealing tape between the window frame and the foil-faced polyiso completes the air-tight seal. These pictures also give you a glimpse of the 2×4 service partition. That partition is currently being well-utilized by the electrical, plumbing and HVAC subcontractors, and we’re happy to see that, knowing the alternative would be to carve holes and channels into the OSB vapour-barrier. We have chamfered the sides and top of the service partition around window openings as an architectural detail; this also improves the field of view and the amount of light allowed to enter the rooms. Opening Speaker, Local Sustainability Champion: Chris VanderZwan of New Leaf Custom Homes will be speaking on innovation, building Kingston’s “Passive House” (PassivHaus), and climate change. Keynote Speaker: Pamela Blais, the author of Perverse Cities, makes the case that accurate pricing and better policy are fundamental to curbing sprawl and shows how this can be achieved in practice through a range of market-oriented tools that promote efficient, sustainable cities. Doors open at 6:45PM, event runs from 7PM – 9PM. Event will be held at Portsmouth Olympic Harbour, 53 Yonge Street, Kingston, Ontario. Event is free. Please RSVP to info@sustainablekingston.ca or to 613-544-2075 x 3 so that we can determine attendance and appropriate room set up. We had about 50 people come through Kingston Passive House for the tour. There were lots of good questions, in particular about the sub-soil heat exchanger. 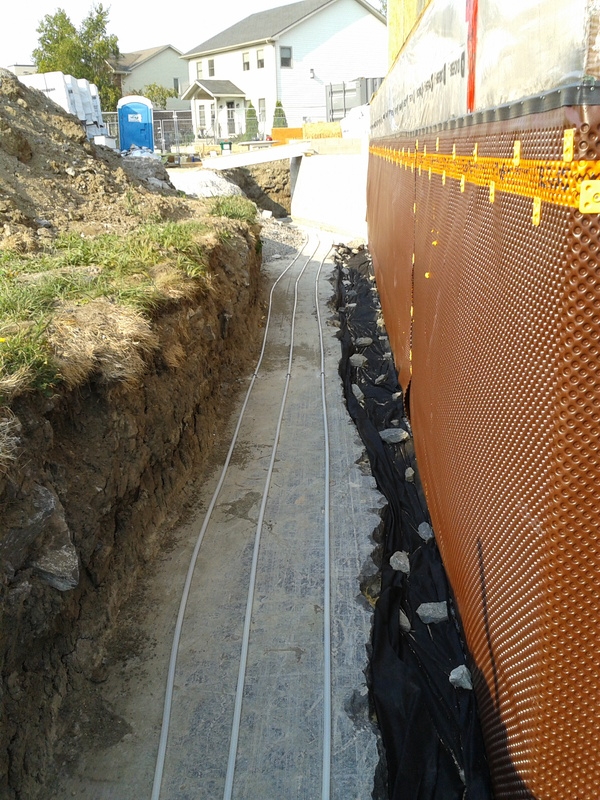 It’s unfortunate the actual PEX lines around the foundation were buried and out of sight, but having the back-fill in place made us feel a bit more comfortable about having guests onsite. There were also a few inquiries as to why we left most of the front wall out while continuing with the second floor structure and walls. We’re glad passers-by had an opportunity to “see” the second floor develop, but the reason we left it open was a logistical challenge for the SIP installation. The front foyer is open above, making the wall 2 full stories high. Code requires continuous timbres from floor to ceiling in this scenario, which for us meant continuous (double 2×6 @ 19 feet long) splines between the panels; the main and top floor walls across the foyer had to be installed at the same time. Once past the foyer, we completed the main floor wall, installed the remainder of the second floor structure, and subsequently the second floor walls. The trusses for the house and garage arrived – some assembly required! We chose a very traditional gable-end roof design which means ladder-trusses on the ends, but our large 36″ overhang (part of the summer shading strategy) resulted in seven foot wide ladder trusses which the supplier didn’t build. Standing trusses is always a bit stressful; you’re standing in precarious positions while attempting to tame a 40 foot long truss being blown around by the wind as it hangs from a crane. Once standing, they become quite a bit more fun. You transform back into a kid as you walk through the wooden maze, adding all the required bracing. 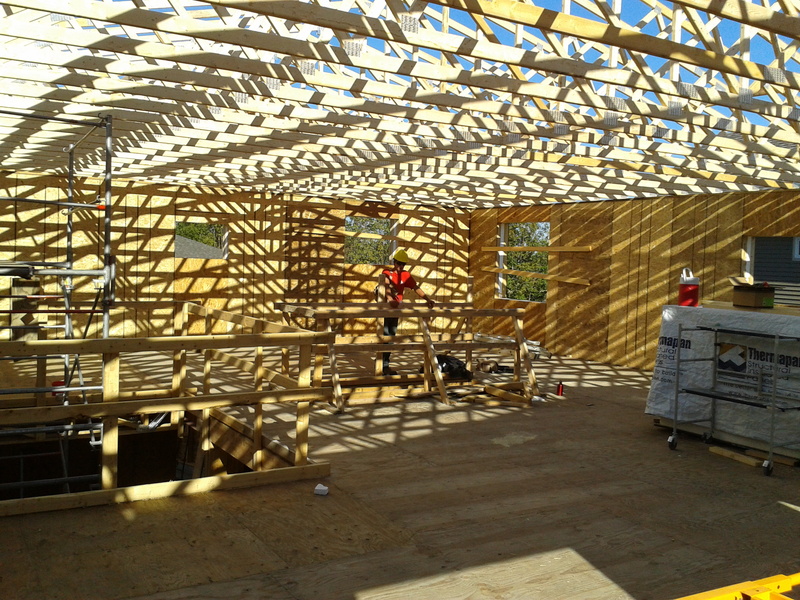 Putting on a roof really transforms a building into a home, but this is no ordinary roof over your head; to ensure we have full depth insulation, the trusses were built with a 30-inch raised-heel. The pitch is mild though (3/12) so even with the heel we’re at or below the height of most other 2-storey houses in the neighborhood. With the sheathing done, we’ll soon apply the underlayment in preparation for the steel roofing. I must admit, I’m really looking forward to closing in this Passive House… Everyone on the crew is more than curious to see how it performs as the heating season knocks at the door! 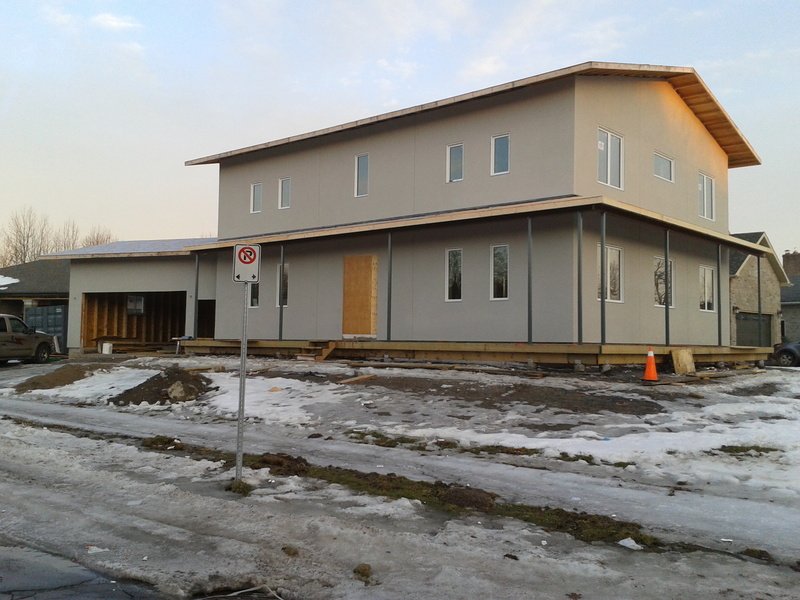 We finally have back-fill at Kingston Passive House, which means it’s time to welcome you onsite for a visit! The afternoon of Sunday, September 8th, we will open the gates and offer you an opportunity to see what goes into the design and construction of a Passive House. We’re still at an early phase of construction, so visitors can see the “bones” before they become hidden. We hope to see you there! 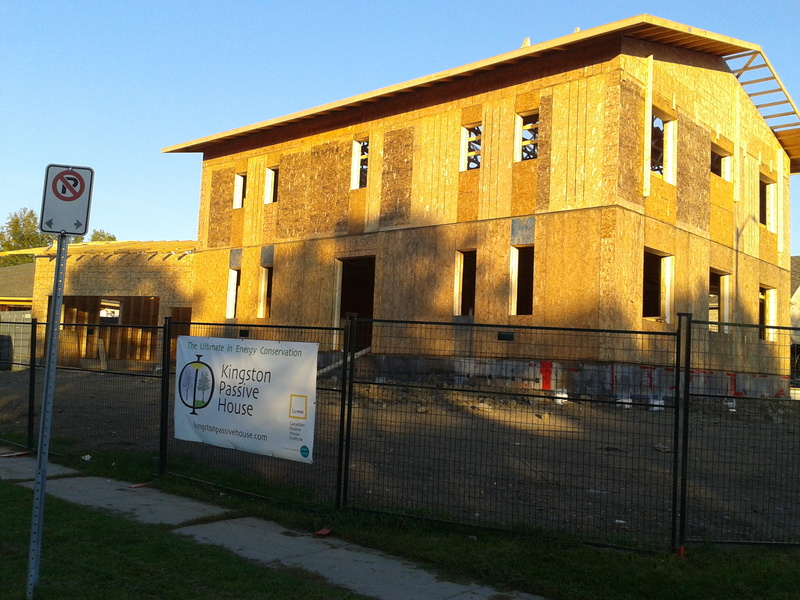 We had a productive week at Kingston Passive House. There were a number of tasks which had to be completed before the “prior to back-fill” inspection. First on the list was a basement floor; a SIP foundation requires both the basement slab and the main floor be installed before back-fill. Of course, very little of this house can be considered typical, so pouring a concrete slab is a multistage process. We started by rolling the 3/4″ gravel; this isn’t normally necessary, but it helps with leveling and flattening out the more pointy stones before laying down the vapour barrier and subsequent insulation. The vapour barrier was cut or stretched around protrusions and subsequently taped. This picture shows how the poly is sealed to the rim of the sump-pump tank. Once the lid is sealed to the tank, it becomes part of the barrier. 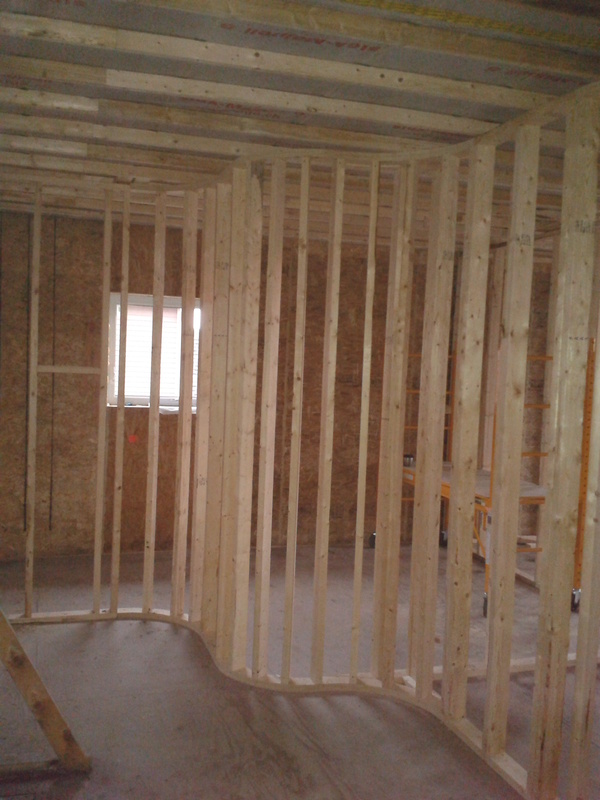 There is 10-inches of EPS insulation below the slab. It was installed in two layers with offset joints for improved stability and reduction of convection currents. It is a lot of insulation, but this floor will be high and dry. 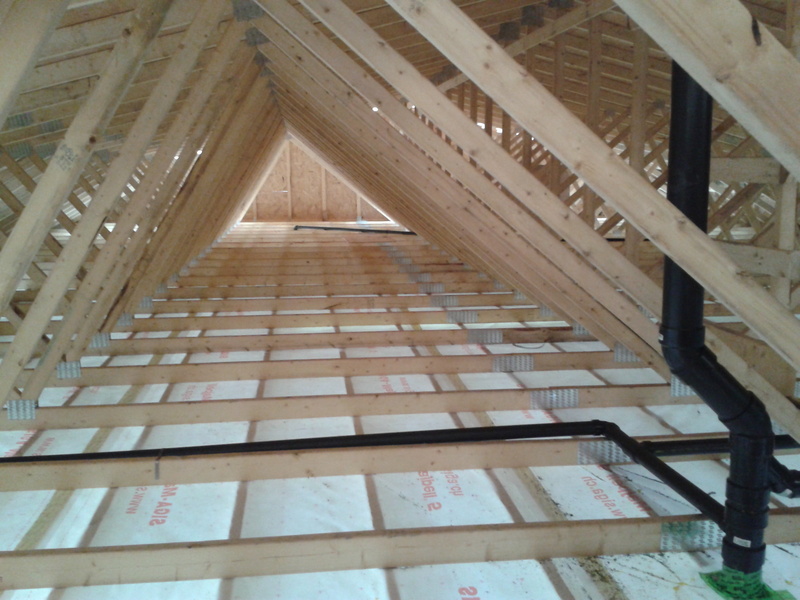 We were fortunate to source recycled insulation for this job. It was formerly installed on a flat roof and is in remarkably good shape. 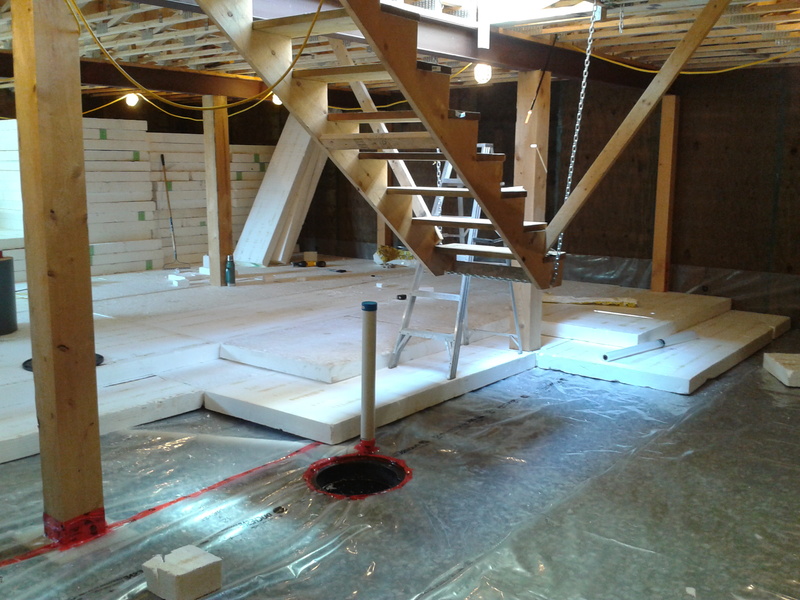 The staircase was already onsite, and supporting the bottom from chains meant there was clearance for installing the poly, insulation, concrete and just enough room to pass the power-trowel underneath. We had to pump in the concrete because the window is located on the South corner for solar gains – not accessible by truck without destroying the neighbors lawn. Another task was the placement of the subsoil heat exchanger (SHX) PEX tubing. 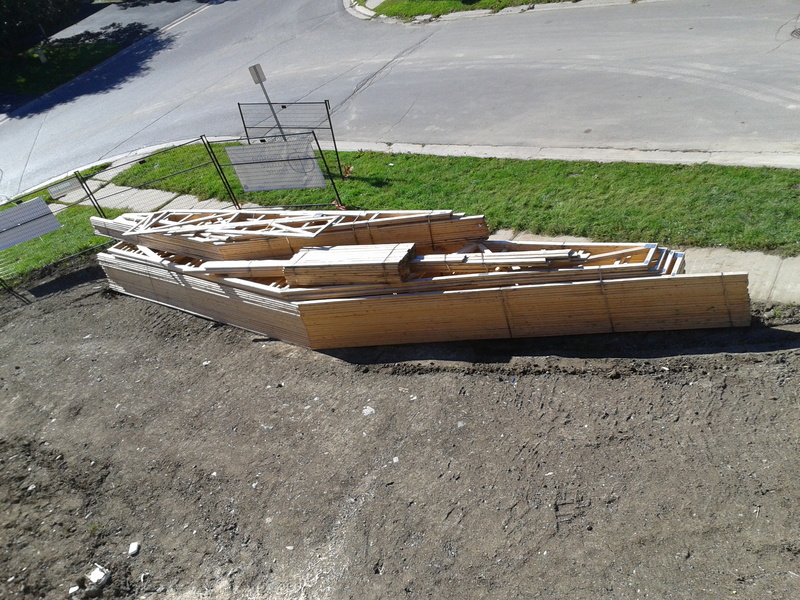 There are three continuous (no joints or fittings) lengths around the perimeter of the foundation. They are filled with water and pressurized to 30 psi. We wound have liked these to have been a bit deeper for a more constant temperature, but bedrock is the next best thing. We’ll pack dense clay above these tubes to ensure there is effective thermal conductance with the rock. The landscape cloth will help keep that clay out of the gravel and drainage ports through the footings. We were very pleased to learn that our SHX design (and overall HVAC strategy) was signed-off by an HVAC engineer. He had never seen anything like it, and is also very curious to see the true (measured) performance numbers of this house. 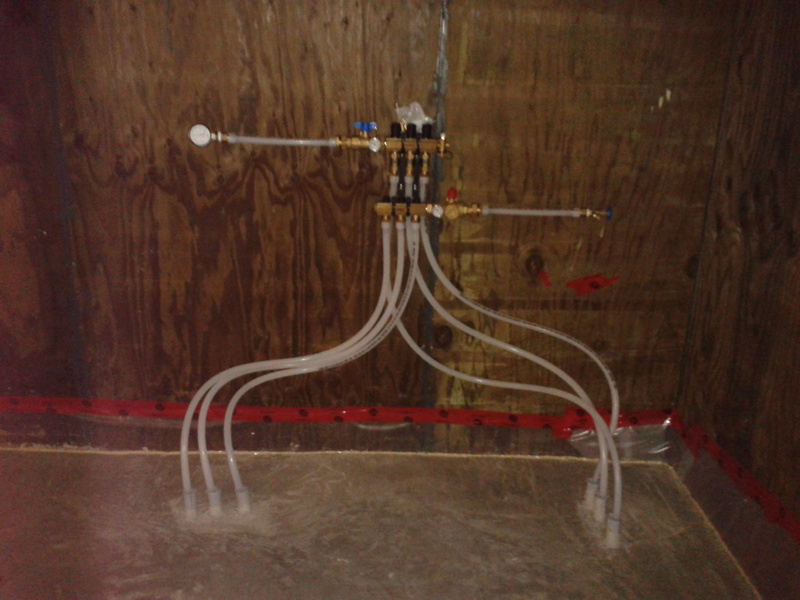 The photo below shows the “in” and “out” manifolds connected to the PEX loops. We still have a 2×4 service partition to build along the walls, so these manifolds will be permanently mounted at a later time. The picture quality isn’t great, but in addition to a pressure gauge there is a thermometer on each manifold so we can monitor the ground temperature and observe the temperature drop (or rise) caused by the liquid-to-air heat exchangers (coils) in the HRV ducting. The building department requested that our SIP foundation installation be inspected by the manufacturer prior to back-fill. We were happy to get a vote of confidence from the manufacturer yesterday, and even more happy to see the positive reaction of the building inspectors that came out to join the party.